Fonterra Australia’s Proud to Be a Chef program is celebrating its 20th anniversary and culinary apprentices from all over Australia will once again have the chance to participate in a life-changing experience. Proud to Be a Chef – Australia’s number one foodservice mentoring program, is designed to help create tomorrow’s culinary leaders through the recognition, professional development and ongoing support of today’s apprentices. 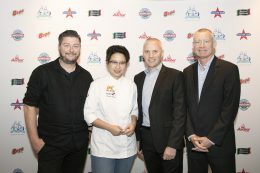 From 1 August through to 31 October, culinary apprentices across Australia are invited to apply for a place in the 2019 Proud to Be a Chef program by visiting www.proudtobeachef.com and filling out the online entry form. The judging panel will select 32 finalists who will be flown to Melbourne in February to take part in the all-expenses paid four-day mentoring program including field tours, skills workshops, dining at prominent restaurants and educational masterclasses with industry leaders. At the end of the program the standout apprentice is awarded an International Culinary Scholarship tailored to their personal interests and professional goals. Mentors for the 2019 program will be Scott Pickett, Chef/Owner of Pickett & Co. including the recently opened Matilda restaurant; Christy Tania, internationally acclaimed pastry chef and owner of Glace Dessert Artisanal; and Peter Wright, Fonterra Foodservice Executive Chef. The finalists will have the opportunity to work ‘up close and personal’ with these mentors both through masterclasses and site visits to restaurants. “Having achieved the milestone of its 20th anniversary, Proud to Be a Chef is firmly established as the industry’s pre-eminent mentoring program, and presents a fantastic opportunity for Australia’s passionate young chefs seeking to excel,” says Fonterra Australia Director Foodservice Jeff Dhu. “As always, our focus is on identifying and developing their raw talent and providing them with the best mentoring experience possible – and not just for the duration of the 2019 Proud to Be a Chef program, but over the longer term”, says Jeff. For full details about the 2019 Proud to be a Chef program, including entry forms, contact information and video interviews with past winners, finalists and mentors, please visit http://www.proudtobeachef.com.